I grew up with fairy tales. I love them. One of my most precious treasures from my childhood is a huge book of fairy tales that I received on Christmas Eve one year. In its pages I fell in love with Beauty and the Beast. I remember when the original animated movie came out and I was disappointed at how ferocious the beast was, because in my version of the tale, the beast was kind and gentle from the beginning. I adjusted to the Disney version and love it almost as much, but I was thrilled when one bit of the original tale crept into the new release--Maurice's desire to return home to Belle with her requested rose. That made me smile, only to myself, for no one else would understand the importance of that small detail unless they are familiar with the original story. I love fairy tales because my mom loves fairy tales. She shared two of her own precious childhood fairy tale books with me when I was about ten years old. The books were yellowed along the edges and each tale had one or two pictures to illustrate the story. Mom trusted me with her copies of the books, even though the covers were barely attached (and I soon lost them through multiple readings). 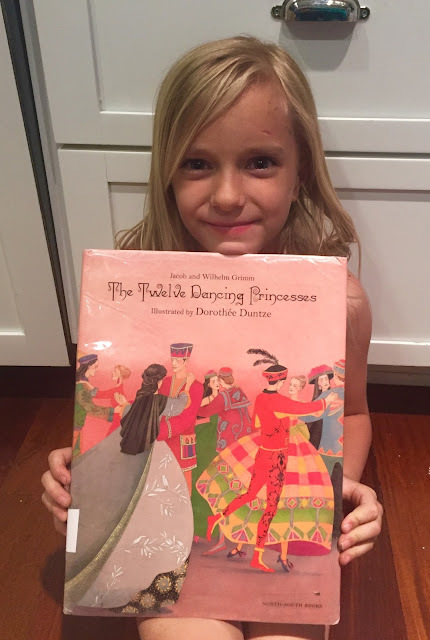 Her favorite quickly became one of my favorites, The Twelve Dancing Princesses--twelve sisters who secretly escaped their locked room every night and the soles of their shoes were worn paper thin by morning while they danced the night away at a castle that could only be reached inside a boat shaped like a swan. I love that story and can see the illustration of the crippled man who solved the mystery in my mind. I've also always been secretly glad that Disney has never commandeered it and commercialized it. The images in my mind will always be enough for me. Imagination is one of the unsung but most valuable gifts of childhood, and I will always be grateful to a mom who cultivated my love for fairy tales. I wasn't as careful with my own children's exposure to the tales of my childhood, but Eve surprised me Friday after school as I got a quick dinner ready in the kitchen. "Mom, can I read you my new library book? It's called The Twelve Dancing Princesses." The title got my full attention. Was it the same as my fairy tale? She sat against the cabinet for ten minutes, and I listened as I cooked. It was almost the same. And all the memories of my childhood flooded back--time spent in my bedroom with the door shut, dreaming of dancing the night away. As I write this post, Eve is reading her library book aloud again. This time, her grandma is on speaker phone, listening to her granddaughter share the beautiful story. Some moments stay always in memory. I never could have imagined the full circle this one would take.